is placed on the penalty mark. remains on his goal line, facing the kicker, between the goalposts until the ball has been kicked. at least 9.15 m (10 yds) from the penalty mark. Decides when a penalty kick has been completed. He does not play the ball a second time until it has touched another player. the ball touches either or both of the goalposts and/or the crossbar, and/or the goalkeeper. the referee allows the kick to proceed. if the ball enters the goal, the kick is retaken. if the ball does not enter the goal, the referee stops play and restarts the match with an indirect free kick to the defending team. if the ball enters the goal, a goal is awarded. 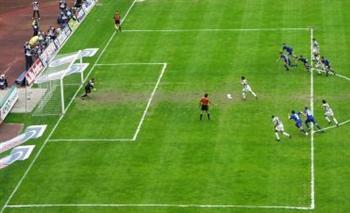 if the ball does not enter the goal, the kick is retaken. if the ball rebounds from the goalkeeper, the crossbar or the goalpost and is touched by this player, the referee stops play and restarts the match with an indirect free kick to the defending team. a direct free kick is awarded to the opposing team, the kick to be taken from the place where the infringement occurred. play is restarted with a dropped ball at the place where it touched the outside agent. It is an infringement to enter the penalty area before the kick has been taken. 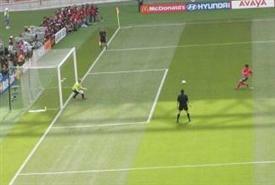 The goalkeeper also infringes the Laws if he moves from his goal line before the ball has been kicked. Referees must ensure that when players infringe this Law, appropriate action is taken. Only one person at a time is authorized to convey tactical instructions and he must return to his position after giving these instructions. Players are entitled to take liquid refreshments during a stoppage in the match but only on the touchline. It is not permitted to throw plastic water bags or any water containers onto the field.